Welcome to the world of licensed Community Association Managers. As you assume your role, board members, owners, and vendors alike will look to you daily for your problem solving prowess. You’ll field complaints, manage staff, and enforce rules. 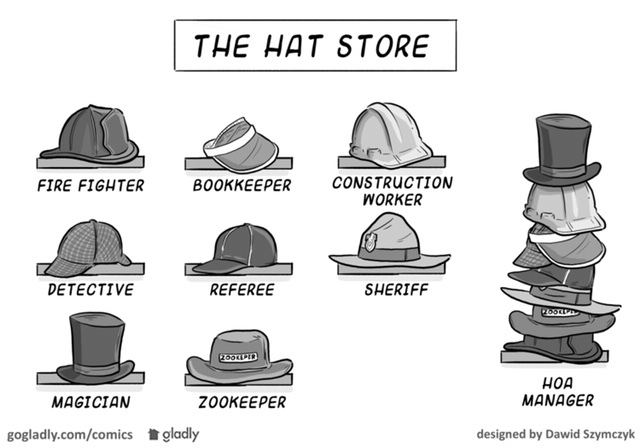 You’ll wear many hats (sometimes all at once) as you orchestrate inspections, repairs, and improvements. So basically, you’ll be linchpin for a mountain of complaints and resolving everyone’s problems. We jest — mostly. But since you went into this with your eyes open, you know full well that the demands on the CAM are enormous. As you play the parts of amateur psychologist, accountant, landscaper, repairman, police officer, purchasing and procurement agent, advisor, mediator, inspector, comforter, complaint department, encourager and counselor, your plate is going to be pretty full. Fortunately, many others have accepted this challenge before you, blazing a trail of success. And if you listen to and apply their advice, it can make a huge difference in your efforts. With this in mind, here are 5 basic ways you can be an effective Community Association Manager — without losing your mind. If you’ve already read your community’s governing documents, read them again with your new-found wisdom and licensure. If you’re newly assigned to a property, one of the first tasks should be to read the association’s governing documents. Do you have to memorize them? No. But new community association managers should read them all, including the Plat Plan and Articles of Incorporation. You should also go online and review public records, making sure you have all of the recorded amendments. Since there is likely a ton of material, consider adding printed or writeable self-adhesive tabs to the pages that you will refer to regularly (such as annual meeting dates, quorum requirements, association responsibility for maintenance repair and replacements, owner’s responsibility, and architectural rules). Add tabs and highlight the most important parts to make navigating these documents as easy as possible. Your reliance on them will decrease over time, but keep this version around so you can easily point to them when answering common questions. People can’t argue as much if they see it all in black and white. Resist the temptation to bend the HOA rules for anyone, including residents you’re personally fond of. 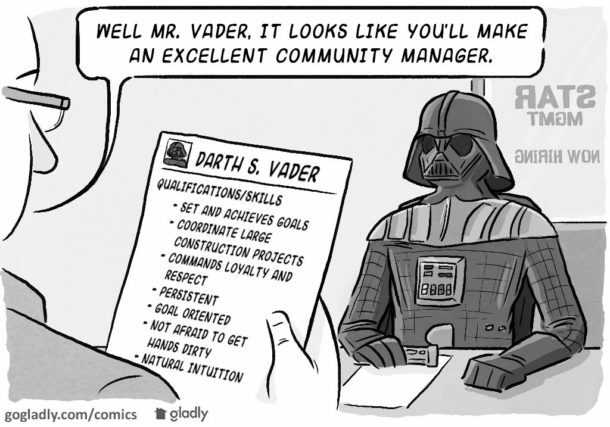 Your job of community association manager will be easier in the long run if you treat everyone the same, so nobody comes to you with an expectation of special treatment. This may require you to take a hard line on people with whom you don’t see eye to eye. But that consistency will eliminate guesswork and hassle down the road when enforcing rules, dealing with vendors, and applying contracts. It’ll also come in handy in managing committee members and boards of directors. Not only will the clear lines of consistency make decision-making easier, but it will also minimize threats to your license. An HOA has many moving parts. Even the best community association managers can’t be expected to be on top of every dynamic 100% of the time. You must learn to trust and delegate responsibilities and tasks to your staff. Sure, sometimes there are trust issues, and and times it actually seems to do things yourself rather than explain a need to others and then follow up with them. But if you try to do everything yourself, it won’t be long before you get burned out — which usually leads to failure on some front. Trust that you have selected great people to work with you, and allow them to assist you. Learn to let go and let those people succeed at what you’ve asked of them. Many times, people will pleasantly surprise you. Even the most family-oriented people can let a busy professional life creep in at home. If scheduling the landscape meeting or having a pow-wow with the board president is your most important priority, it might be time to take a step back and reorganize those priorities. Schedule a date with your spouse or plan a family outing. Do not continually look at your mobile device during family or couple time. You might miss something! Every one of us could stand to slow down and re-focus on what is really important. In addition to making your family life better, you’ll be taking a little time out to decompress. And when it comes to your job as a CAM, that can’t be anything but helpful. Sounds simple, right? But as you know, taking a breather can be easier said than done on a particularly busy day. When things get chaotic or a particular issue is causing you grief, take a moment to breathe. Look up from your computer, lock your office door for 10 minutes, call a friend, or take walk outside the community where you won’t be disturbed. Center yourself and break away. You might be surprised at the perspective you gain by disconnecting for even 30 minutes. Know your documents. Enforce consistently. Delegate. Leave work at work. Take breaks. If you can do these 5 things as a community association manager, you’ll be well on your way to keeping your community — and the rest of your life — in top form.